TripAdvisor launched a new flight search tool today, and by the looks of it, the tool appears to be a game-changing addition to online travel planning. TripAdvisor’s flight search is the first such tool to offer a fees estimator, which allows travelers to compare airfares with fees (checked bags, onboard meal and entertainment purchases, etc.) added in. 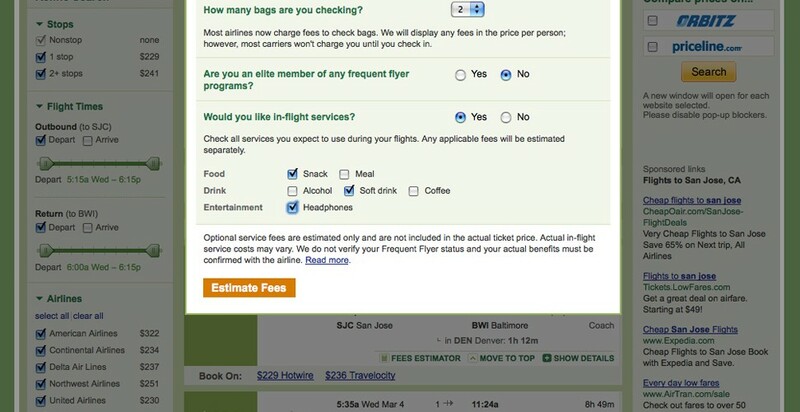 This alone makes TripAdvisor’s flight search uniquely useful to budget-minded travelers. TripAdvisor’s flight search is also the first and only search tool of its kind to include fares from Expedia and Hotwire, and the first to present results from those providers alongside results from Travelocity. TripAdvisor claims this will give users more search results than any competing flight search can provide. The flight search also offers seat information from our sister site SeatGuru, which complements the tool’s real-time seat availability charts that accompany the search results. Frequent flyers can enter their program and status information and see what sort of money-saving benefits (free bags, reduced fees, and so forth) are available to them. Other neat features include airline info bubbles, which describe some of the benefits of each airline, plus an alert that tells you when business- or first-class fares are close in price to coach fares. Aside from that, TripAdvisor’s flight search is clean, easy to use, and fast. The search results load quickly, which is impressive considering there are so many. There’s a lot of options, so it takes a few minutes to familiarize yourself with it all. I encourage you to check out the flight search for yourself and come back here to share your thoughts. What do you like? What misses the mark? Leave a comment below after your test drive and let me know what you think.